As I mentioned in my last post the General Conference of my church, the Church of Jesus Christ of Latter-day Saints is this weekend. We have one session left and it has been a wonderful 2 days of spiritual feasting. One thing that has made the experience more powerful for me is twitter. There are 2 twitter handles #LDSConf and #twitterstake that so far has been 99% faithful Saints pointing out quotes and insights as we all listen to talks. Some of you might say ‘how can you concentrate on the message while focusing on twitter. I would argue that I focus on the message more because the learning experience is expanded. When I was a little girl I went to a special school- Reid School- in Salt Lake. As part of their curriculum my teachers at Reid always used more than one learning method to teach concepts. For instance, when studying multiplication the teacher spoke the sums, wrote them on the board and then we repeated out loud the answers. This created a visual, auditory and tactile learning experience. I only attended Reid School for 6 months but it had a profound effect on my intellect and educational development. I always try to learn in multiple ways. When I was in college I used to call my mother and say ‘I just need to explain this to you’. Simply reading a textbook or listening to a lecture was not enough for me to absorb information, but speaking it out loud kept it in my mind. 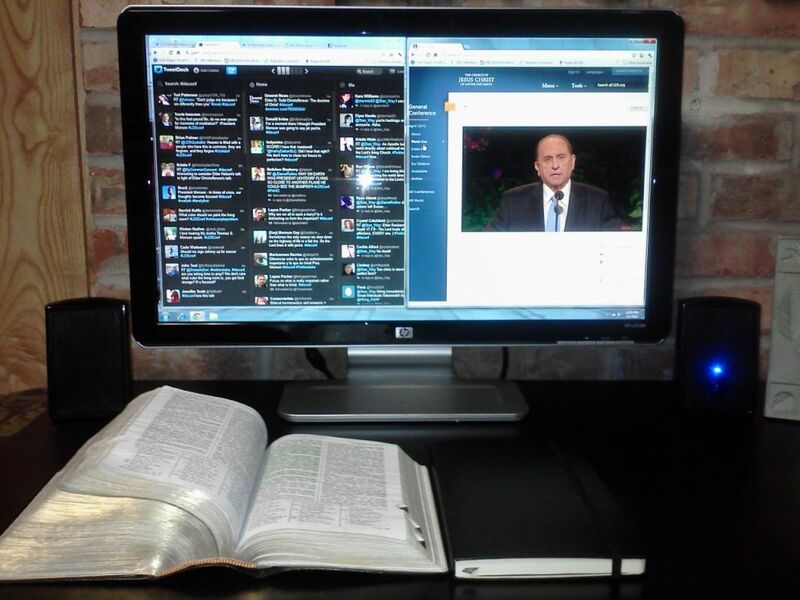 When I follow General Conference on twitter I am reading, typing, listening and watching. Plus, with DVR I can go back and listen again to anything I might have missed. This is also just the first of many viewings. Sometimes I will have a pen and paper and other times nothing at all. Each time I learn something different; however, the twitter interactive experience can only happen while watching live and I think it is worth taking advantage of. One person @Stan_Way on twitter posted this photo of his set up for watching Conference. I think it is awesome. By the way #LDSConf was the 2nd most popular twitter handle yesterday. Sounds like I’m not the only person to get on the bandwagon! Its amazing how quickly the videos from Conference become available. Yesterday I mentioned this talk by Elder Holland and it is already up on youtube. It is an instant classic and touched on many topics that I’ve been pondering lately. I also appreciated Elder Holland’s explanation of the Parable of the Workers in the Vineyard- something I’ve always wondered about. This talk by Elder Scott was also very moving. So touching how he thanks his wife who has passed on for her continual inspiration. I would also like to say a public thank you to the recently released presiding bishopric and relief society presidency. Bishop Burton has served as presiding bishop since 1995. Sister Beck has been in either the Young Women’s presidency or Relief Society presidency since 2002. I’m grateful for their service. I am particularly sorry to see Sister Barbara Thompson getting released. As a single member I always looked forward to her talks and perspective. She is also a terrific speaker and her talks have helped me in many ways. Well, one more session to go! By the way I’ve gotten 13 new twitter followers in 2 days. Nice!